The Potato chip snack day, or potato chips day, is a day celebrated on March 14 in honor of the salty and delicious snack. The story behind the invention of the snack is funny: One day in 1853 Cornelius Vanderbilt, an American tycoon, arrived at the Moon Lake Lodge restaurant in Saratoga Springs, New York, and asked for potatoes. The restaurant's chef, George Cram, served him crisp potatoes but Vanderbilt complained that they were not crunchy enough, too thick and useless. Chef Kram took the potatoes back to the kitchen, sprinkled them and salted them and served them again to Vanderbilt. But the tycoon was no longer satisfied. So again and again the potatoes returned to the kitchen and spread and salted until they were very thin and salty. Vanderbilt was actually pleased with the final result, and after more customers were enthusiastic about the thin, salty potato slices, they decided to add the dish to the restaurant menu and called it "potato chips". Since Karam was a native African, he could not register his invention as a patent in his name in the United States at the time. Another version says the snack was invented after Kram's sister sliced ​​a too thin potato and the slice fell into hot oil. Kram loved the result and decided to make it a serving in the restaurant. In the 1920s, potato chips began to be marketed in the shops after entrepreneur Hermann Leigh invented a potato-making device. At first they marketed the snack in tin cans, and in 1926, Laura Skoder invented the sealed bag by adding two wax papers, and after the cellophane was invented, the potato chip began to be marketed in sealed bags, and the snack became popular and began to be produced in large quantities. 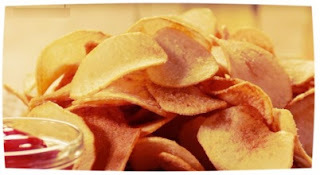 How to celebrate the day of the potato chips? Buy a bag of potato chips, eat it with salsa sauce, tomato sauce, garlic sauce or nothing and enjoy.